City of Red Deer RCMP Superintendent Ken Foster is crediting good old fashioned police work for the seizure of 29 firearms and the arrest of two individuals who were charged with 198 criminal charges. On Nov. 5th, RCMP officers from the Red Deer Community Response Unit executed a search warrant at a storage locker located at 4904 79th St.
Officers seized 25 rifles, three shotguns, four crossbows and two pellet guns. The officers also seized ammunition, bicycles, dirt bikes, chainsaws, a generator and electronics equipment. 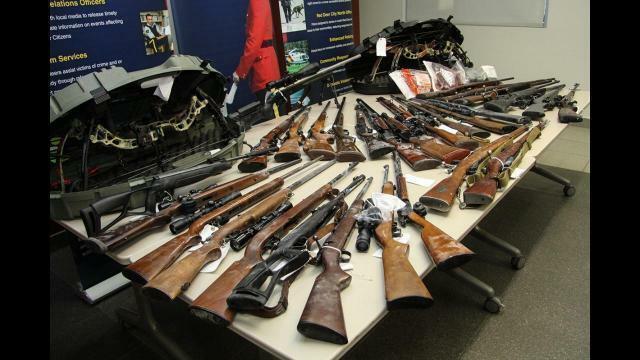 The weapons were hidden in a sleeping bag, hockey bag, a ski bag and gun cases. Eight of the weapons and both dirt bikes were reported stolen so far and Foster said the RCMP is continuing to look into the other weapons. On Nov. 22nd, officers executed a search warrant at 58th Ave. in Highland Green. The officers seized a shotgun, a magazine, a replica firearm, methamphetamine, large amounts of ammunition and numerous other previously reported stolen items including identity documents. Red Deer Mayor Tara Veer and Foster both credited Project Pinpoint for these arrests and seizures. “Project Pinpoint is a great example of something we initiated a couple years ago which focused on prolific offenders. Now we are seeing the result of that,” Veer said. Foster added it is important for residents to report all crimes and be engaged. “That doesn’t mean we can solve your individual crime and doesn’t necessarily mean we can show up to a crime depending on the severity, but the analytics become very important,” Foster said. Andrew Scott Charpentier, 25, faces a total of 100 charges regarding the search warrants including 29 counts of unauthorized possession of a firearm, 28 counts of possession of a stolen firearm, 28 counts of careless use of firearm or ammunition, one count of unauthorized possession of a weapon, one count of possession of firearm with altered serial number, three counts illegal possession of or trafficking in government documents, two counts of failure to comply with undertaking, seven counts of possession of stolen property under $5,000 and one count possession of Schedule I substance (crystal meth). Kelsey Pearl Torpe faces a total of 98 charges including 29 counts of unauthorized possession of a firearm, 28 counts of possession of a stolen firearm, 28 counts of careless use of firearm, one count of unauthorized possession of a weapon, one count of possession of a firearm with an altered serial number, three counts illegal possession of or trafficking in government documents, seven counts of possession of stolen property under $5,000 and one count possession of Schedule I substance (crystal meth). Veer said these charges speak to what Red Deerians are facing in terms of property crime. “It takes time to do good investigations and for us to move forward as a community, we need to be patient as the RCMP are investigating these prolific offenders,” she said. Foster added that the firearms represented a danger to everyone in the community. “That is a significant amount of fire power,” he said. “Property crimes are significant. Some people think it is just a theft from a shed or a theft from a vehicle, but it all feeds criminal activity and lifestyle. Veer added that despite high property crime due to the provincial economy, the City and the RCMP are not sitting still. “As the dynamic of crime continues to change, we will continue to adapt new strategies in order to attend to the number one concern of our citizens,” she said.